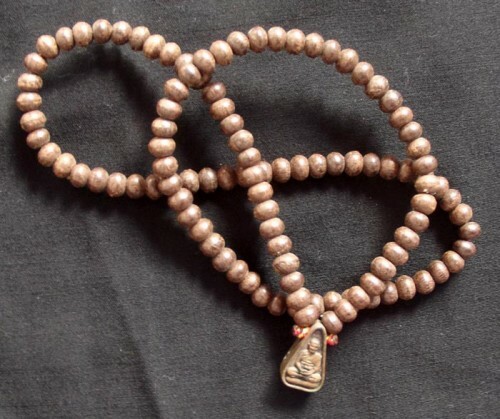 This Sacred Tamarind Tree wooden bead Rosary is a very old Rosary which Pra Ajarn Oe obtained about 8 Years ago, and has been empowering throughout the whole 8 Years since they came into his possession. The central piece (used to mark the beginning and end of one round of prayers or Incantations), is an Image of Luang Por Kong Sosingsi, which is in itself a Sacred Amulet made from Sacred metals. The age and quality and also the power of this Rosary is instantly noticeable in the hand, when compared with lower quality mass produced Rosaries. The Sacred Wood beads are much harder and heavier than one might expect. One notices that there is a difference to this Rosary simply by touching it. 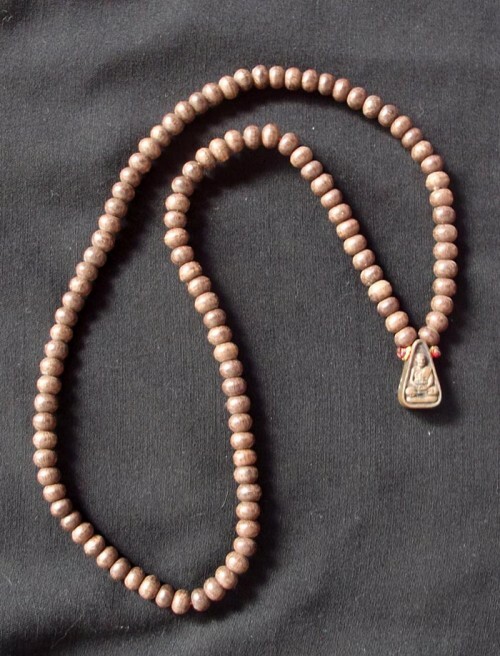 This Sacred Old Rosary empowered with the Blessings of Luang Por Sosingsi and Luang por Oe, is a fine Rosary to use for increasing the power of ones Prayers, Faith and Concentration. 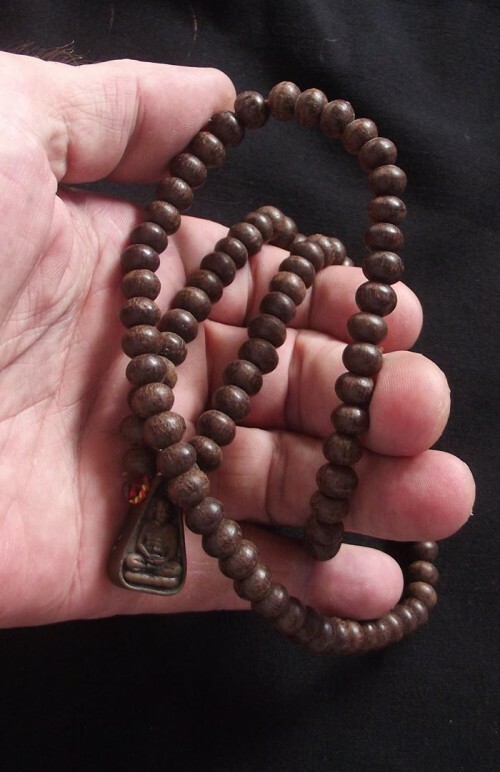 An Inspiring and Faith Instilling Buddhist Rosary of Respectable History, Authentic Empowerment, and 8 Years of Sacred Blessings of Buddhist Guru Monk, Luang Por Oe Putto Raksa. Made from Mai Makham Prong Fa – a Sacred type of Tamarind Tree. 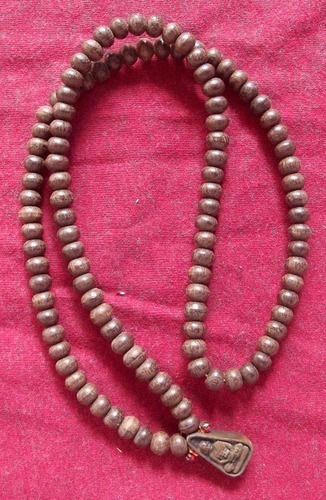 It is neither often nor is it easy to find truly blessed and empowered Buddhist Rosaries, for which reason, this Rosary is an irrepeatable opportunity to possess a truly well made Buddhist Rosary from sacred Holy Wood from the Hands of a Great Master, and then 8 years of further Empowerment and Blessing by Luang Por Oe. We cannot recommend this Rosary Highly enough, for both meditative and devotive practices. Will last for more than a lifetime if properly taken care of, and can already begin to be considered antique Buddhist Sacred Art of the Highly Desirable Variety.